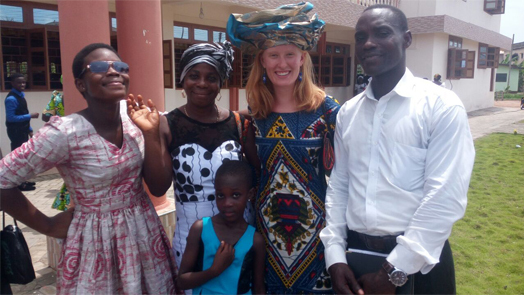 Hosted in Ghana, Kennedy-Lugar Youth Exchange and Study (YES) Abroad participant Elizabeth Schaefer has become deeply connected with her host family, community, and country. A student at Moorhead High School, in Moorhead, MN, Elizabeth is studying abroad in Cape Coast for the 2015/16 academic year. “Having the opportunity to become part of a new family is what I value the most about my exchange. Although I have lived here for less than a year, I feel so loved and so happy. As the end of my exchange approaches, I frequently have people ask me if I'm excited to be going home. I never know how to answer them though, because, to me, I am home. With my mom, my dad, and my sisters - right where I belong,” says Elizabeth. Elizabeth is an active member of her Ghanaian high school’s basketball and debate teams and enjoys learning how to make traditional Batik with the visual arts teachers after school. Her paramount take-away from her exchange thus far is her relationship with her host family and peers, which has continued to develop and mature. Elizabeth enjoys attending church with her host family on the weekends and is always grateful for the opportunity to meet Ghanaians in her everyday life. Elizabeth has shown a keen interest in learning traditional sewing techniques, and hopes to shadow a seamstress before concluding her program. Her host family describes Elizabeth as someone who “behaves like a typical Ghanaian teenager, and it is a pleasure to host her.” Throughout her participation, Elizabeth has exuded an ambassadorial spirit that has created connections throughout her host community.